Our beautiful and sturdy red oak gun rack holds your favorite piece while the locking storage compartment keeps your ammunition safely tucked away inside the raised panel door. The attached protective felt strips help prevent scratching your rifles or shotguns. This rack faces with your guns pointing to the right and it ships to you fully assembled so you can start using it right away. Item stands 16" high, 24" wide and is 5" deep. The inside dimensions of the storage compartment are 22" wide, 5 1/2" high, and 3 3/4" deep. We are happy to offer you your choice of finishes at no additional cost: walnut, or golden oak. 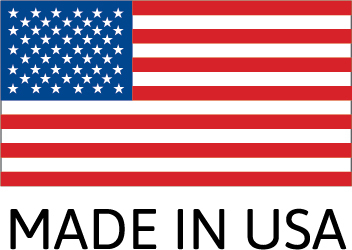 All of our items are proudly Made In The USA!